Today I thought I would share this great song by Scottish band Travis. I realise this is the second Friday in a row that I’ve blogged about a Glaswegian band, with last week’s blog about a Belle & Sebastian song. This is purely accidental I can assure you. “Why Does it Always Rain on me?” was released in August of 1999 and is one of my favourite songs by this band. It reached number 10 in the DUK singles charts, and was a hit in many other countries too. It is from their second studio album, “The Man Who”. 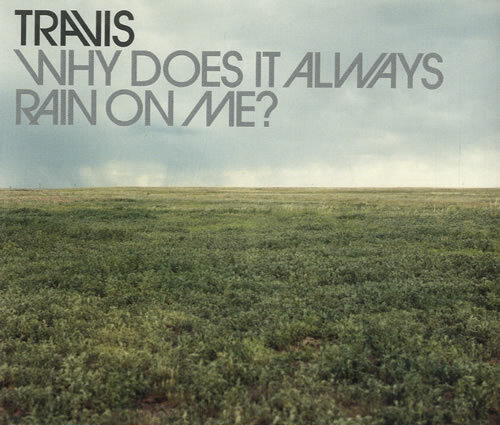 Travis’ single “Why Does it Always Rain on me?” reached number 10 in the DUK singles charts in 1999. And here is the official video. Enjoy! Which is your favourite Travis song? The only one of these albums which I own is “LA Woman” by The Doors, although I do own other albums by The Smiths, Madonna (yes, her greatest hits album “The Immaculate Collection”), Johnny Cash and The Eagles. I also own songs by New Order, Mott the Hoople (whom I blogged about here), and I have heard but do not own anything by The Smashing Pumpkins and Rage Against the Machine. I have no clue who OutKast are, have never heard their music nor am I likely to I feel. So, clearly I will blog about “LA Woman”, but not just because it is the only one in this list which I own. It is a great album, as the caption to the album cover says, it was a real return to The Doors’ roots with bluesy music. Little did they know when they recorded it that Jim Morrison would be dead within 3 months of its release. 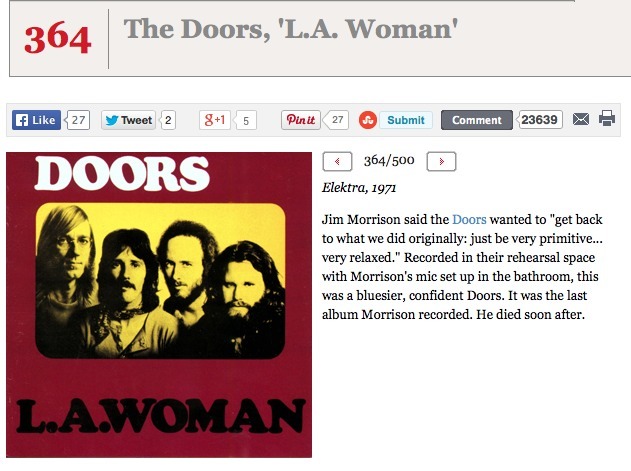 At number 364 in Rolling Stone Magazine’s 500 greatest albums is “LA Woman” by The Doors. The discovery of quasars in the 1960s played a crucial role in helping show that the Universe was different in the past. This had important implications for the testing of the two competing cosmological theories of the time – the “big bang theory” and the “steady state theory”. The steady state theory, whose main proponent was Fred Hoyle, argued that the Universe had always existed and did not change in time. The big bang theory, on the other hand, argued that the Universe had a finite beginning in time, and that since this beginning had expanded, cooled and evolved. The discovery of quasars was made using radio astronomy, and in fact the word “quasar” stands for “quasi-stellar radio source”. Later similar objects would be found that did not emit strongly in the radio, and so the term “QSO” (quasi-stellar object) was suggested. Both acronyms are used today, pretty much interchangeably. The term “quasar” is often used incorrectly for QSOs which do not have strong radio emission. There was a little radio astronomy done before the 2nd World war. Karl Jansky accidentally discovered radio waves coming from space in 1931. After a little research he realised that the signal he was detecting with his radio receiver was coming from the centre of our Milky Way galaxy. However, Jansky was an engineer working for Bell Labs, and his request for funding to follow up this discovery and do a more complete survey of radio emissions from space was rejected, and Jansky re-assigned to another project and not given the freedom of following up on this discovery. The unit of flux in radio astronomy, the Jansky, is named after him. In 1944 Dutch PhD student Hendrik van de Hulst predicted the existence of an emission line from neutral hydrogen, due to a hyperfine splitting in the ground state. I will explain in a separate blog the theory behind this, but basically the emission line comes about when an electron jumps between two very closely spaced energy levels in the ground state of neutral hydrogen. 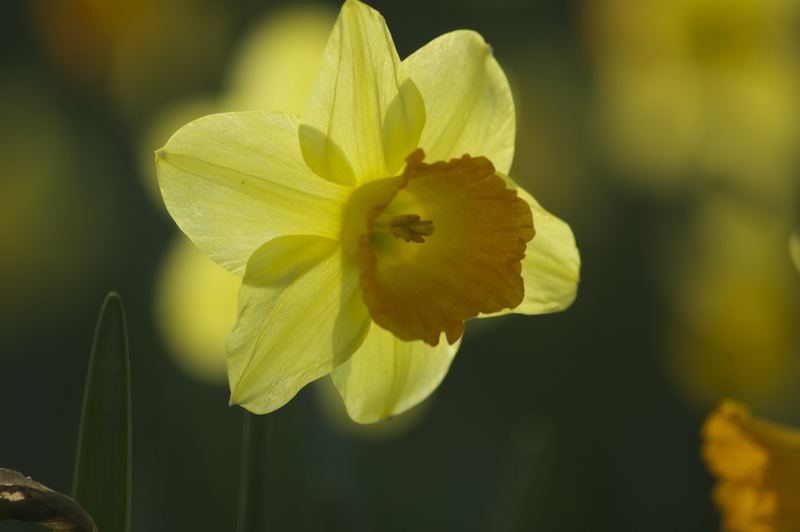 Because the energy difference is so small, the wavelength of the ensuing photon is extremely long – 21cm to be precise. This is in the radio part of the electromagnetic spectrum. With a combination of this prediction, and the developments made in radar during the 2nd World war, the post-war years saw a boom in radio astronomy. One of the first groups to be established was at Cambridge University. The group was initially led by Martin Ryle, who had worked during the war with the Telecommunications Research Establishment on the design of antennae for airborne radar equipment. After the war, Ryle got a fellowship at the Cavendish Laboratories, and it was there that he established what became known as the Cambridge Radio Astronomy group. In 1950 he and his group published the first ever catalogue of radio sources. The paper, published in Monthly Notices of the Royal Astronomical Society (Ryle etal. 1950, MNRAS, 110, 508-523) was entitled “A preliminary survey of radio stars in the Northern Hemisphere”. In this paper they listed the positions of 50 discrete “radio stars”, along with the intensity of each source. The positions were not known very accurately, because the long wavelength used (3.7 metres) meant the resolution of their antenna array could not locate the sources’ exact positions to better than about 1 degree of arc. This was a major problem in identifying which astronomical objects the radio sources were. The second catalogue by the Cambridge group was published in 1955. Entitled “A survey of radio sources between declinations -38 degrees and +83 degrees”, the lead author was John Shakeshaft of the group, with Ryle as second author. It was published in the Memoirs of the Royal Astronomical Society, (MmRAS 1955, 67, 106-154). Just like the first catalogue, the second one was done at a wavelength of 3.7 metres. In this second catalogue, 1936 radio sources were found. Of these, 500 of the most intense could have their positions determined to an accuracy of about +/- 2 arc minutes in Right Ascension, and about +/- 12 arc minutes in declination. The team found most of the sources were of small angular diameter, and were distributed isotropically over the sky (that is to say not in any particular direction). About 30 of the sources were of larger angular diameter, between 20 and 180 arc minutes, but the majority of these larger sources were close to the plane of the Mily Way galaxy and so the authors suggested that they represented a “rare class of galactic object”. They then went on to say that about 100 of the sources appeared to be related to objects which were in the New General Catalogue or the Index Catalogue; both optical catalogues of nebular objects which had been put together in the 1800s and the first decade of the 1900s. In 1959 the Radio Astronomy group at Cambridge produced their 3rd catalogue, using an upgraded antenna array. This time the observations were done at a frequency of 159 MHz (which corresponds to a wavelength of 1.9 metres). The paper, entitled “A survey of radio sources at a frequency of 159 Mc/s” was published in the Memoirs of the Royal Astronomical Society with D.O. Edge as lead author, and listed 471 sources (MmRAS 1959, 68, 37-60). It was revised in 1962 by Bennett, so the revised 3C catalogue had 470 sources (Bennet, 1962, MNRAS, 125, 75-86). Initially astronomers used the 3C catalogue to try to find optical counterparts to these radio sources. After 1962, with Bennet’s improved catalogue, the revised catalogue (3CR) was used. 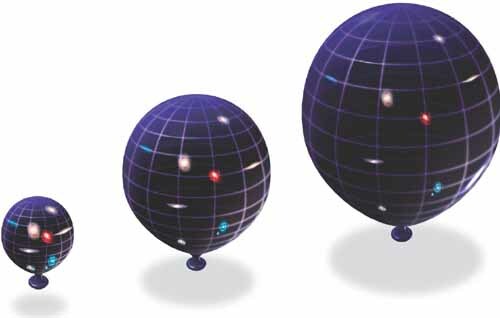 The first object in the 3C catalogue to which an optical counterpart was found was the object 3C 48, in 1960 by Thomas Matthews and Allan Sandage (both of Caltech). Using radio interferometry to narrow down its position, and then subsequent direct optical photographs, they found that 3C 48 corresponded to a faint blue star-like object. When its spectrum was taken, it looked unlike the spectrum of any star. First of all it contained emission lines (the spectra of stars usually show absorption lines), and these lines were broad not narrow as is usually the case with blue stars. But, most puzzlingly, the pattern of lines did not seem to fit any pattern that astronomers had seen before. By 1963 Matthews and Sandage had found three starlike counterparts to three sources in the 3C catalogue, and published this in the Astrophysical Journal (“Optical Identification of 3c 48, 3c 196, and 3c 286 with Stellar Objects”, 1963, ApJ, 138, 30-56). The nature of the three sources was not known, but at least it seemed that they had been identified. A breakthrough happened in 1962. One of the other 3C sources, 3C 273, was predicted to pass behind the Moon on several occasions. Using the Parkes Radio Telescope in Australia, Cyril Hazard and John Bolton were able to make measurements which allowed Caltech astronomer Maarten Schmidt to find its optical counterpart. Using the Mount Palomar 200-inch telescope, Schmidt obtained a spectrum of the star-like object. The spectrum was as confusing as that of 3C 48, he could see emission lines but was not able to identify them, the pattern just didn’t seem to make any sense. After much head scratching, Schmidt realised that the lines corresponded to hydrogen emission lines, but they were redshifted to such an extent that he had failed to recognise them. The redshift he measured for 3C 273 was nearly 16% of the speed of light, an unheard of redshift at that time. Assuming Hubble’s law which relates redshift to distance, this put 3C 273 at a huge distance from Earth, much further away than any galaxy ever seen. This work was published in a one page letter in Nature in 1963 – “3C 273: a star-like object with large red-shift”. Nature 197, 1040-1040. 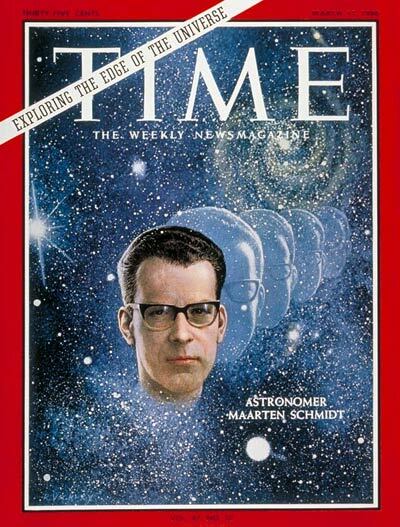 Caltech astronomer Maarten Schmidt, who in 1963 discovered quasars. Very soon afterwards, Jesse Greenstein and Matthews at Caltech identified the redshift of 3C 48, and found it to be 37% of the speed of light, over twice as far away as 3C 273! (“Red-Shift of the Unusual Radio Source 3C48”, 1963, Nature 197, 1041–1042). As more research was conducted it was found that not all these quasi-stellar objects with extremely high redshifts had strong radio emission. some were “radio quiet”, so the name “QSO” was coined, but because the term “quasar” had been in use for quite a while by this time, many or most astronomers refer to these objects as quasars whether they are radio-loud or radio-quiet. I will go into more detail in a future blog about what we think quasars are. It was in the early 1980s, using the Hubble Space Telescope, that their host galaxies were observed for the first time. They are the extremely active core of galaxies, but are only found in the distant universe. The lowest redshift quasar is at a redshift of 0.056. To put this into context, the redshift of the Norma Cluster is 0.01570, so the nearest quasar lies some 3 times further away. The further away one looks, the more common quasars are. As they are not found in the local Universe, and as looking far away means looking back in time, quasars are very clear evidence of the evolution of the Universe. They are one of the strongest pieces of observational evidence for an evolving Universe, and thus one of the pieces of evidence which helped show that the steady state theory of the Universe was wrong. 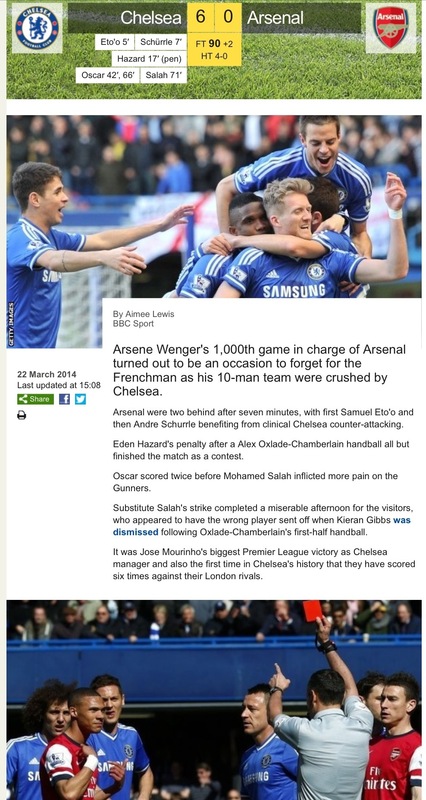 It was Arsène Wenger’s 1000th game in charge of Arsenal, and one he will want to forget. In a goal fest at Stamford Bridge, Chelsea ran riot over an abject Arsenal, giving Chelsea their biggest ever win over their London rivals. The gulf between the two sides left one wondering how Arsenal are within just a few places of top-placed Chelsea. As Mourinho said after the game, the match was over within the first 7 minutes, with Chelsea already 2-0 up. By half time it was 4-0, and the second half was just a lap of honour for the dominant Chelsea side. The victory leaves Chelsea 4 points clear at the top of the Premiership, but the lead is a little misleading as all the teams immediately below them have games in hand, with Manchester City having three games in hand! 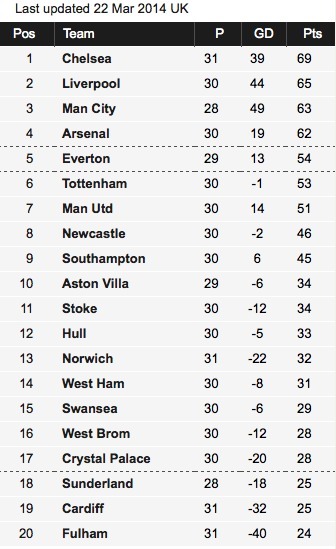 The English Premiership as of Saturday the 22nd of March. Chelsea have the easiest next two Premiership matches of the top three teams. They play Crystal Palace away next Saturday and the following Saturday play Stoke City at home. They are both games Chelsea would expect to win. Liverpool’s next two games are a home game against Sunderland this coming Wednesday and then next Sunday a potentially tough game against Tottenham Hotspur away. For Manchester City their next two games are both tough ones, the first is tomorrow (Tuesday) evening against Manchester United away and then next Saturday with an away game against Arsenal. Hopefully Chelsea’s lead will be even bigger in two weeks’ time! Today I thought I would share this great song by Scottish band Belle & Sebastian – “The State I am in”. 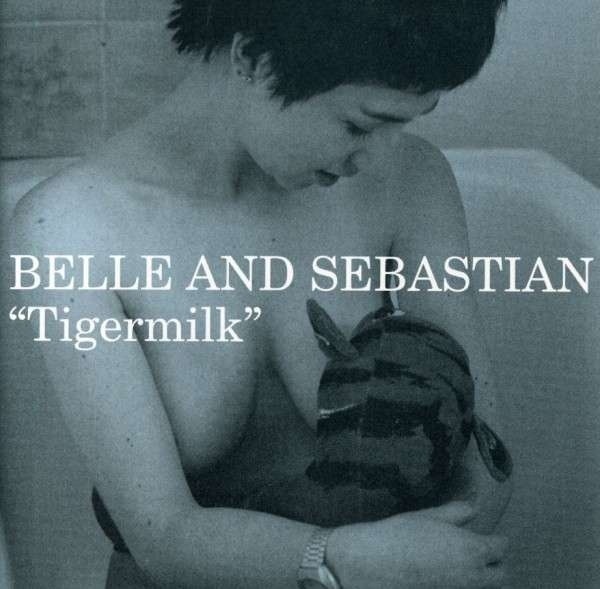 It is the first track on their debut album Tigermilk, and was released in 1996. The words and music are by founding member of Belle & Sebastian, Stuart Murdoch. The “Mark’s and Spencer’s” referred to in the song is the same “marks and sparks” referred to by David Bowie in the Mott the Hoople song “All the Young Dudes” that I blogged about here. This is the second Belle & Sebastian song I have blogged about, the other one being their cover of “Poupée de Cire”, here. Enjoy! With the announcement earlier in the week of what appears to be direct evidence for cosmic inflation, I ended up getting involved in a discussion on one of John Gribbin‘s FaceBook posts with a gentleman who said “the Big Bang theory will be discredited in the next few years” (or words to that effect), and that the “Steady State theory” was the correct cosmological model. I was a little surprised that there were even (presumably intelligent and informed) people who still felt that the steady state theory had any credence left. So, rather than answer this gentleman in private, I thought I would do a brief series of blogs on why we think that the big bang theory provides a more correct model of the Universe than the steady state theory. I should remind readers (all two of you! ), a theory is never complete. It is always a work in progress, and this is as true of the big bang theory as of any other theory. As Karl Popper said, it does not matter how many times a theory is confirmed, one robust refutation of that theory and it needs to be revised and/or abandoned. Cosmologists have been trying to test predictions of the big bang theory since Lemaître first proposed it in the 1920s, and they will continue to do so for the foreseeable future. The expansion of the Universe was observationally discovered by Edwin Hubble and his observing assistant Milton Humason in 1929. What Hubble and Humason found was that more distant galaxies appeared to be moving away faster than nearer galaxies. The recession velocity was determined by the Doppler shift in the spectral lines of the galaxies and was a pretty robust result. The distances were a little less robust, as there was no reliable way to determine the distances to the galaxies Hubble included in his study. However, since then we have been able to use the reliable method of Cepheid variables to determine the distances to a large number of galaxies. For example, the Hubble Space Telescope (named, of course, after Edwin Hubble) was able to observe Cepheid variable stars out to large distances in the 1990s. This was a Hubble Key Project. The relationship between the distance of a galaxy and how quickly it is moving away from us, the so-called Hubble law, is now well established. 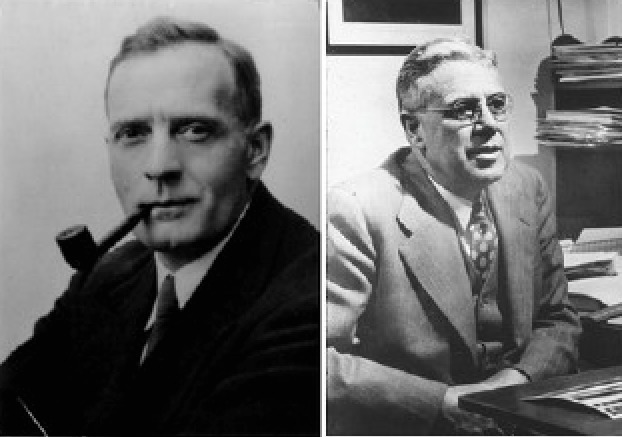 Edwin Hubble (left) and Milton Humason, who discovered the expansion of the Universe. In the 1910s Vesto Slipher, working at the Lowell Observatory in Flagstaff Arizona had found that from a sample of 25 “spiral nebulae” (as they were then known), 22 appeared to be moving away from us with 3 moving towards us, based on the Doppler shift in their spectral lines. Slipher noted that there was something strange about this, but never made the connection to an expanding Universe. Although Hubble himself never actually said it, the most natural interpretation of the Hubble law is that the Universe is expanding. It is not that the galaxies are rushing through space, but rather that space itself is expanding. A galaxy which is twice as far away as a given galaxy will move away twice as quickly if space is uniformly expanding. Naturally, if space is getting bigger then it would have been smaller in the past – so Hubble’s discovery lent natural support to the emerging idea of a Universe which started out small and is getting bigger. In an expanding Universe, more distant galaxies move away quicker than nearer ones because of the expansion of space. The galaxies themselves are not moving through space, it is space itself which is expanding. Einstein developed his General Theory of Relativity, a radically different approach to understanding gravity, in 1916. This theory describes gravity as a bending of space and time, rather than the classical idea of gravity that Newton had developed in 1666. In 1917, when Einstein applied his new equations to the Universe, he found that it predicted a dynamic (expanding or contracting) Universe. But, at the time the general consensus was that the Universe was static, so Einstein introduced a fudge-factor, the “cosmological constant”, to give his equations a static solution. When the expansion of the Universe was later discovered by Hubble and Humason, Einstein purportedly said that the cosmological constant was “the biggest blunder of my life”, as he could have predicted the expansion of the Universe some 12 years before hand. Two years after Einstein introduced his cosmological constant, in 1919, Dutch mathematician and physicist Willem de Sitter produced a solution to Einstein’s equations which had no matter but just the cosmological constant. This predicted an expanding Universe, but nobody took much notice as everyone knew the Universe contained matter. In 1922, Russian cosmologist Alexander Friedmann produced the first solutions to Einstein’s equations which contained matter but which also predicted that the Universe might expand. Unfortunately for Friedmann, he died in 1925 and his work went largely unnoticed at the time, probably because he only published in Russian. A few years later, in 1927, Belgian cosmologist and Catholic priest Georges Lemaître independently came up with the same idea as Friedmann. He was aware of Slipher’s work on the redshift of spiral nebulae, and conjectured that it might be a sign of the Universe expanding. He published his work in an obscure Belgian scientific journal, so it too was ignored. But then, renowned cosmologist Sir Arthur Eddington published a long commentary of Lemaître’s paper in the widely read Monthly Notices of the Royal Astronomical Society, propelling Lemaître’s work to prominence. Einstein became aware of Lemaître’s work, but was not convinced by it. In 1919, Willem de Sitter produced a solution to Einstein’s equations which predicted an expanding Universe, but it had no matter in it. 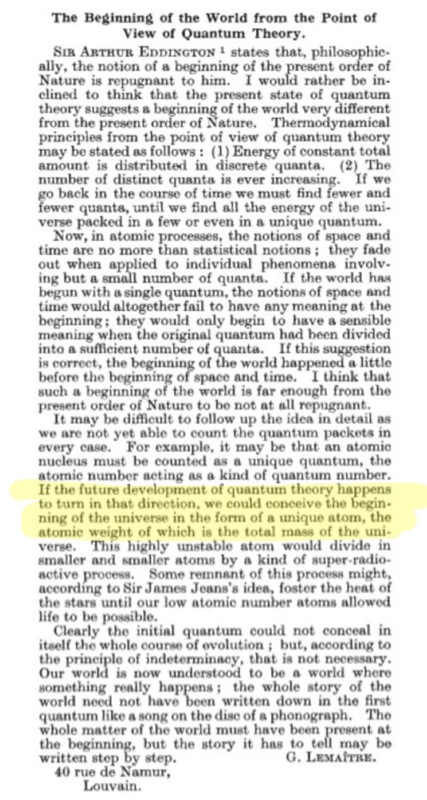 Then, in 1931, Lemaître published a letter in the most prestigious scientific journal, Nature, outlining his ideas on cosmic expansion in some detail. In this letter he suggested that the Universe had begun in what he called a primordial atom. Lemaître suggests one, single, great atom, embracing all energy, started the Universe. Einstein was won over, and in 1932 he and de Sitter published a paper of a model we now call the Einstein-de Sitter model, in which they stated that the correct cosmological model was one which would just about keep on expanding to infinity, but would take an infinite amount of time to do so and would never re-collapse. In the 1940s a fierce opponent to Lemaître’s “primordial atom” theory would emerge, Sir Fred Hoyle. In part 2 of this blog next week I will talk about his competing theory, the “Steady State theory”, and Hoyle’s on-going battle in the 1940s and 1950s with George Gamow, who became the chief champion of the “primordial atom” theory.